Ever wish you could curate your own your tour around artists or themes you love? Now you can. We’re going to loop you in on a best kept secret at the Barnes—Personalized Docent Tours. That’s right—you can actually choose your own adventure of their world-class collection through a one-on-one tour with one of their on-staff docents. Ask all of your most pressing art history questions or silently reflect on the beauty of your favorite piece—the choice is yours! 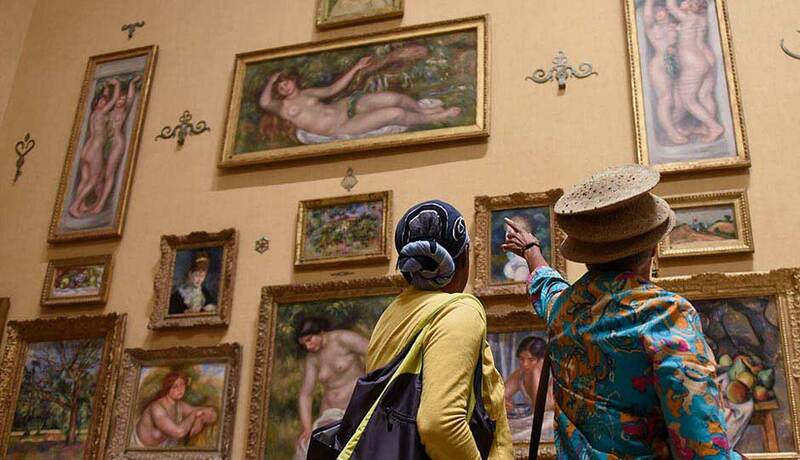 Whether you’re an art aficionado yourself, never know what to get your art-loving partner who has it all, or trying to impress out-of-town friends—a docent tour is a memorable experience you won’t want to miss. You can register for a tour by calling 215-278-7035 or emailing reserve@barnesfoundation.org. You’ll need to request a tour (which run Wednesday through Monday) at least a week in advance so the docent has time to prepare your personalized program. You’ll be wowed by the extensive collection of impressionists, post-impressionists and early modernist art. We’re talking about 181 Renoirs, 69 Cézannes, 59 Matisses, 46 Picassos, 16 Modiglianis and 7 Van Goghs. The Barnes recommends keeping your group small and intimate (a maximum of 6 people). This gives every member of the group a chance to ask any questions or engage in a conversation with the docent. Grab your best friends, your family members, or go for a girl’s weekend. What a unique way to spend time with your nearest and dearest! You have free reign to choose the topic you’d like the docent to zero in on for your exclusive tour. But we asked the Barnes to share topics groups have chosen in the past to get your ideas flowing: some have requested their favorite artists like Matisse, Renoir, Cézanne or Rousseau (just to name a few!) or themes like nudes, Jewish artists, and female artists. Drawing a blank? That’s okay too—your docent can help you narrow down your ideal tour prior to your arrival. Whichever topic you choose, take a second to let this intimate and unforgettable experience sink in, as you explore and learn more the iconic collection. From Van Gogh to Picasso, there’s something bound to pique your interest and inspire you. What are you waiting for? It’s time to experience the Philadelphia art scene like you never have before. For more information about the Barnes, visit barnesfoundation.org.